Hippy Pits. First of all can we take a moment to realize how awesome that name is? HIPPY PITS! And their slogan is: "Live like a hippy, don't smell like one." So anyways I've been trying out this all natural deodorant and over all I can honestly say I'm pleased. I haven't tried it whilst jogging or playing soccer or anything strenuous like that - mostly because I don't do those things - but I sweat and get funky like an athlete and so far it's held up. I applied the deodorant before bed and slept with it on. Darning! Bold! No seriously, I don't know what I do in my sleep that makes me smell so funkadellic in the morning but the Hippy Pits kept me fresh all night long. Part two of the test: How long can I wear that same application throughout the next day? Well, it lasted until around 1pm so that's about 15 hours of pure all natural deodorization I got. So what's the deodorant made of? The Live Love Lavender scent is contains shea butter, coconut oil, tapioca flour, baking soda, lavender oil and many other natural goodies. Aluminum, Phthalates, Parabens and other icky chemicals. Hippy Pits is not tested on animals and is 100% vegan. Keep in mind, this is not an antiperspirant so it's not going to stop you from sweating. That might take some getting used to. I couldn't care less about pit sweating but the wet sensation is a little different. If where you keep your deodorant is cool, you might want to warm it up a little bit so it will be easier to put on. You can rub it between your fingers or put it in the palm of your hand and swirl it with your finger until it becomes creamy like cake frosting. 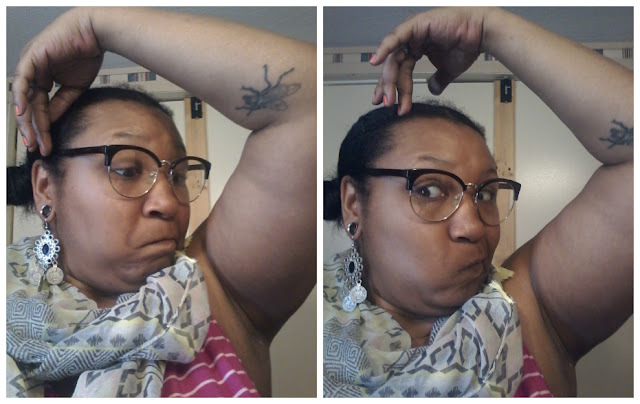 Wash your pits with soap and water before reapplying if you're super funky. Maybe it was just me, but when I tried just adding more deodorant whenever it wore off, it only added lavender fragrance on top of odor so and that made me seriously smell like a hippie. Regular deodorant can stop funk in its tracks but natural deodorant doesn't contain the harsh chemicals that do that so keep your nose open and don't wait until you're making people's eyes water before trying to reapply. Try using it in um...other areas. I would't suggest putting this on your privates or anything like that but, you know... aroouuuuunnnd them, right in the crease of the thigh to fight off, ahem, trouser odors when you're working out. I'm a dancer so I'm not ashamed to admit I experimented with that. It's natural ingredients so why not? If you've got massive bosoms like me, try putting some in between and under your boobies to keep that post-workout, summertime "where-is-that-smell-coming-from?" odor away. Think you're ready to try some? 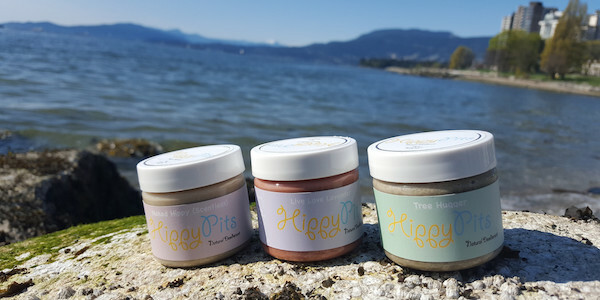 Hippy Pits is available in three different fragrances: Tree Hugger (Eucalyptus, Tea Tree), Live Love Lavender and The Naked Hippy (Scentless). Want some Hippy Pits right now? CLICK HERE TO GET UN-FUNKY! Love your review! haha! It's exactly the info we'd actually want to have. :) Sounds like a great product, I hope I win! Looks like an awesome formula. I make nearly the same thing and ALL of my customers say the deodorant works, 100% satisfaction rate. You don't need the horrid chemicals to keep the pits smelling fresh! This sound like a really great product and I will definitely be trying. I'm impressed that it lasted 15 hours!